If you merely scanned today’s Darren Rovell ESPN article on a new survey of NFL fans, you might be forgiven for coming away believing that fans are leaving in droves, turned off by the national anthem protests inspired by Colin Kaepernick. If you bothered to actually read the damn thing, you know this isn’t close to being true. 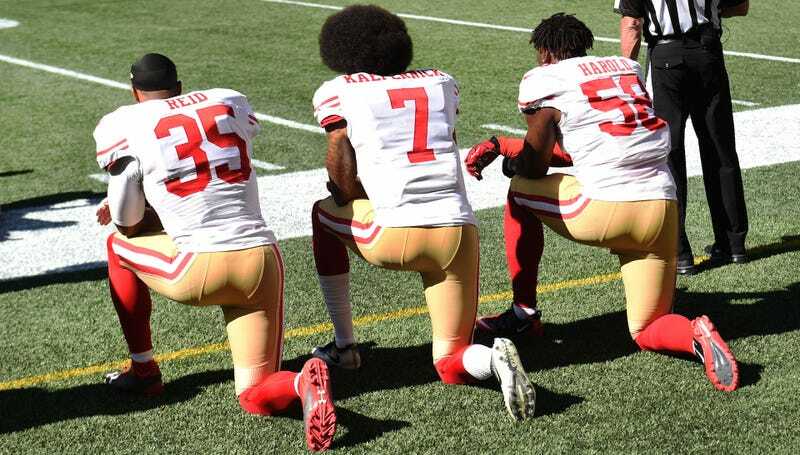 National anthem protests are the number one reason NFL ratings and game attendance saw declines last year, according to J.D. Power. As for the actual survey, J.D. Power asked 9,200 fans whether they’d watched fewer games last season, with 26 percent of those who did saying they did so because of protests and 24 percent saying they’d tuned out because of the prevalence of domestic violence incidents. That sounds like a lot! Buried towards the end of the blog, was the most important number: Only 12 percent of fans surveyed actually said that they watched less football. So that seemingly big number of people disgusted by Kaepernick’s protests? Just 26 percent of 12 percent. That’s just 287 of 9,200 people who claimed that they’ve tuned out because of protests. Compare that with the 2,484 people who told the survey they watched more football last year. And if a larger share of respondents claimed they watched more NFL, the fact that NFL ratings were actually down last year is good enough reason to discard this survey as meaningless. (Self-reporters are notoriously unreliable, and good pollsters are much more concerned with measuring how people actually act than with how they claim they act.) That the survey is being gussied up to make a political point—when there have been rating drops across all programming and all channels, thanks to larger, unpreventable industry trends—is nothing short of data malpractice.